Combining days of the Old East, with new flavours of the West, The Delhi provides a unique experience in authentic Indian cuisine. 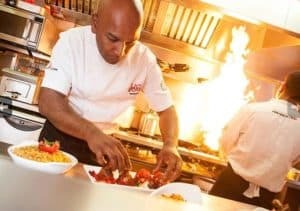 With a revamped website coming soon, a new flavour-filled menu and the option to dine in or takeaway, head to Warwick Road to discover the best kept secret in Solihull – including a whole host of offers for you to enjoy! Using only the freshest of ingredients, the award-winning chefs create fragrant dishes in an open kitchen, filling the restaurant with bold aromas. Inspired by the modern-street foods of Delhi and diverse regional flavours of India, the new menu offers unique dishes and unmissable offers. From a mild Bengali Mutton Korma, with mutton leg, sweet onions and bay leaves to the Gunpowder Chicken Curry, with a rich dark sauce packed full of spices – there’s sure to be something for everyone. 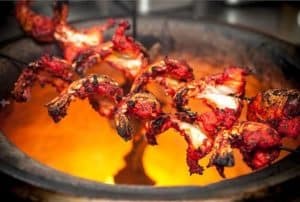 The Delhi’s ‘Meal for Two’ offer, means you can enjoy two poppadoms and dips, a portion of onion bhajis, a portion of chicken tikka, two mains of your choice, a pilau rice and a naan for just £19.90 – saving over £10! Or, if there’s a few more mouths to feed – why not try the ‘Family Feast for Four’? For just £38, tuck into four poppadoms and dips, two portions of onion bhajis, two portions of chicken tikka, four mains of your choice, two portions of pilau rice, two naans and a 1.5L bottle of soft drink – saving you over £25. Not forgetting ‘Date Night or Mate Night*’ from £13.50 per person. For Mate Night, choose any classic starter, any curry from the ‘British Indian Kitchen’ section of the menu, plus any rice or any naan. Or if you’re doing Date Night, ditch the starter and choose from a 250ml glass of house wine or a pint of draught Cobra. Available Sunday to Thursday (maximum – party of four). For parties larger than four, why not choose the group menu*? For £14 per person, enjoy two courses from a set menu, plus an arrival course of poppadoms and dips. Trying to cut down on eating out and takeaways? Maz’s Indian Kitchen is the answer. For £60 per person, you can learn to cook in an authentic style with step-by-step professional tuition from one of The Delhi’s award-winning chefs, Maz Rahman. Each class is hands on and will cover a full meal, with all ingredients and recipes provided – there’ll also be an opportunity to eat what you make at the end. Class times and days can be flexible, for more information call the restaurant or email cookeryclasses@thedelhi.com. And there’s no need to worry about dietary requirements – The Delhi’s dishes are all individually marked to highlight vegan, vegetarian, gluten-free and dairy free dishes, as well as those containing eggs and nuts. Has this tickled your taste buds? Head to their website, www.thedelhi.com or call 0121 705 1020 to discover more. The Delhi is open, Sunday to Thursday, 5pm to 12pm, and Friday to Saturday, 5pm to 1.30am – 678 Warwick Road, Solihull, West Midlands, B91 3DX.